Charming style blends beautifully with Telluride's turn of the century architecture. 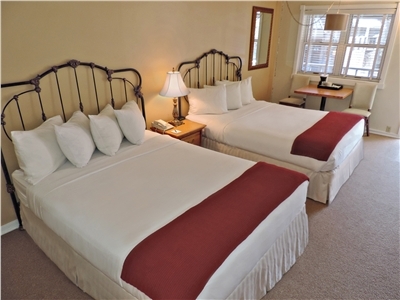 Located just 1 block from Historic Main Street, shops, restaurants and free gondola, all of our rooms are tastefully appointed and offer private baths, ski racks, cable T.V. with HBO. Your stay includes complimentary fresh baked pastries, coffee, assorted teas, and juice, in our spacious guest reception area. There's also a sauna and outdoor hot tub, on-site guest laundry facilities, on-site parking, daily maid service, and on-site management. The Victorian Inn, Telluride! Where Location, Value, Comfort & Service come together! 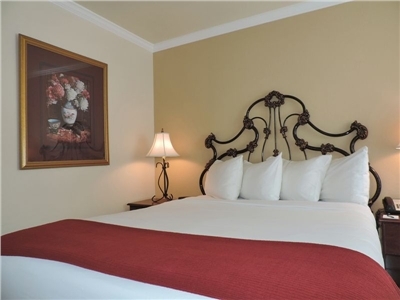 The ADA/WCA Classic One Queen room provides a wheelchair accessible shower and a heavy-duty bench and backrest. This room is approximately 275 sq. ft. 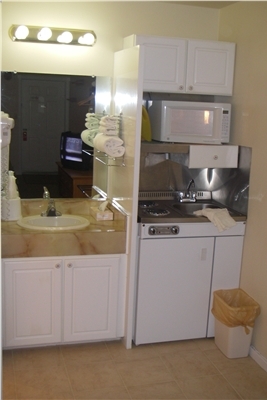 It has an one queen size bed, private bath, flat panel T.V. 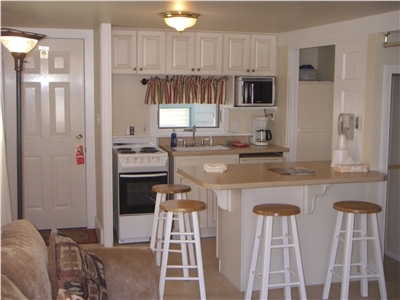 w/ cable, HBO, free Wi-Fi, a mini fridge, coffee maker, and a ski rack. 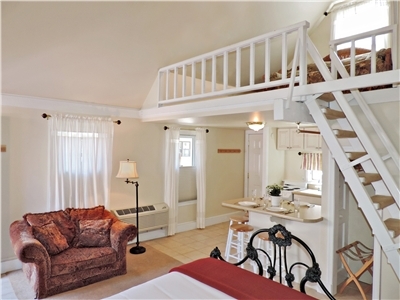 The Cozy Cottage is approximately 500 square feet, entering the main floor you have 1 queen-sized bed, a private bath & shower, full kitchen, breakfast bar, a sofa love seat, an old-fashioned gas burning stove and outdoor bbq grill. 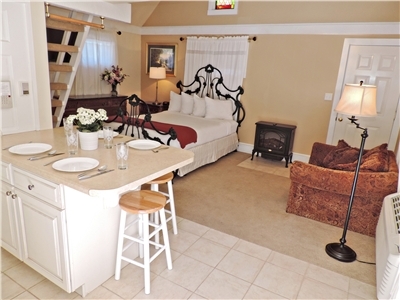 Our Signature One Queen room is a corner unit located on the top floor. With windows on the east and south side, it offer nice views of the box canyon and the ski slopes. This room has one Queen size bed, private bath, flat panel T.V. w/ cable, HBO, free Wi-Fi, a mini fridge, coffee maker, breakfast table, computer desk and a ski rack. It is approximately 300 sq. ft. Please scroll down and read all policies. We will charge the first nights room and tax, per room at the time of booking. The remaining balance will be charged at the time of Check-In. If you cancel at anytime after booking there will be a $50.00 cancellation fee, per room. the deposit for each room reserved will be forfeited. You must cancel before 4 o'clock p.m. Mountain Standard Time, the day before your scheduled date of arrival, to avoid forfeiting your deposit of the first nights room and tax per room, in its entirety. The remaining balance will be charged in full 60 days prior to the festivals beginning date. If you cancel at anytime after booking there will be a $60.00 cancellation fee, per room. If you cancel after 4 o'clock p.m. Mountain Standard Time on the Sixtieth day prior to your scheduled date of arrival, the deposit for each room reserved will be forfeited. You must cancel before 4 o'clock p.m. Mountain Standard Time, the Fifty-Ninth day prior to your scheduled date of arrival, to avoid forfeiting your deposit of the first nights room and tax per room, in its entirety. If you cancel inside the Sixty-day limit, and after the remaining deposit has been charged in full, no refund will be given unless we are successful at reselling the room. We will do our best to resell your room up to the last minute, and reserve the right to discount from the Rack Rate in an attempt to get you back all or part of your deposit, and credit you the difference. If you cancel at anytime after booking there will be a $30.00 cancellation fee, per room. Pets	| Pets of any breed are not welcome on any hotel property. This includes room interiors, hallways, exterior galleries / passageways, decks, any grass area and parking lot. Violation will result in a minimum $300.00 Cleaning and Deodorizing Fee. Violation can result in immediate termination of stay without refund of any deposit. All rooms are non-smoking; this includes the burning of any candles and/or incense. We do not have smoking rooms. This property is smoke free. This includes room interiors, hallways, exterior galleries / passageways, decks, any grass area and parking lot. If you smoke there are "Smokers Outposts" located around the building exterior. Pets of any breed are not welcome on any hotel property. There are two outdoor bike racks on this property for bike parking. We do have a limited amount of "loaner" bike locks we are happy to provide you with should you not have your own. You are responsible for providing clean and adequate protection, i.e. clean sheets, blankets, we will allow you to take your clean and dry bike immediately from the sidewalk or parking directly into the room, where you will have prepared in advance a clean area for this recreation equipment to be placed and ensure that our walls and carpet are fully protected. Bikes will not be leaned, locked or left against hotel exterior or guardrails for any period of time. Any room found to have bikes stored outside these guidelines will incur a $100.00 damage fee charged to the credit card on file. There will be a $50.00 per day charge in addition to rooms that continue to leave walls and carpet unprotected from recreation equipment stored in room. Children	| Rates are based on double occupancy. A $20.00 per person, per night fee will apply to each additional guest ages 13 and over. Children ages 12 and under stay free, when accompanied by a parent or guardian.